Me too, Sadie. Me too. “Ever since my act two years ago, there’s been a rule that you gotta wear clothes.” – Steven. The good news is that that is a very good rule in most situations. The bad news is that the episode only once eclipses the brilliance of that line. Plot: While trying to promote the annual Beachapalooza, Steven overhears Sadie belt out one of the highest charting pop songs on the radio, “Haven’t You Noticed I’m A Star”. Impressed with her ability to sing, Steven encourages her to sing for the event. Unfortunately, her overenthusiastic mother, Barbara (Kate Flannery) gets wind that her daughter is going to sing pop records. It all goes downhill from there, leading Sadie ona path to a breakdown before her pop career even starts. Well, all good things must come to an end, and so must Season 2’s run of “very good-to-exemplary” episodes stretching back to “Keeping It Together”. And it ends in the most unusual way – a sequel to the previous episode, written by the same damn people as the previous episode, dealing with many of the same themes as the previous episode. Yet, while “Nightmare Hospital” could’ve challenged for one of the best episodes of the entire season, “Sadie’s Song”… doesn’t. Catch, catch the horror taxi. I fell in love with a video nasty! Catch, catch the horror train. The freeze frame gonna drive you insane! Plot: Steven and Sadie let Lars tag along to Ronaldo’s Horror Club – much to the host’s displeasure. While watching Evil Bear II, the lighthouse starts acting up – much like a thriller. Investigations lead to Sadie getting taken hostage by the lighthouse. With Lars and Ronaldo having a rather frosty relationship, the conspiracy nut contemplates giving said lighthouse a snack to satisfy it – Lars, to be exact. You are reading a review of an episode of a television show – a TV show that lures it’s fans in with cute colors, quasi-lesbian aliens, and brilliant songwriting… and attacks them with emotional resonance, psychological terror, and liberal overtones. In one episode, characters mess around at the arcade. In another, characters expose suicidal self-loathing. In another, a kid and his best friend have a very awkward dinner. What type of adventure are we damned to witness for episode 15 of Season 1B? Find out tonight in Night of The Review Nebula 2: Blogspot Takes Up Space on Your Data Plan! Lars, Ronaldo, Sadie, and Steven are our protagonists of the evening. The first one and the third one are trapped in a rather messed-up relationship, and the second one almost killed the fourth one to fuel his own ego. This can either make for a) juicy drama or b) a trainwreck. Which one is it? Neither, really – although it is damningly dull. “All comedy is derived from fear.” – Garnet. It’s as close to a description of this episode as I can come up with. Plot: Garnet screws up royally while on the phone with Connie’s mother. Incensed, she requests to see Steven’s mom and dad for dinner. Funny thing, though – Steven’s mom is sorta dead, and all of the Crystal Gems have flaws that could screw up a potential dinner. Steven, however, has a trick up his sleeve – have the trio fuse into Alexandrite. Hilarity ensues… and by hilarity, I mean a dinner that makes the ones attended by Frank Reynolds look professional in comparison. There’s a thin, fine line between “characters engaging in momentary idiocy” and “characters becoming around as naive as Ralph Wiggum”. Remember back when I reviewed “Keep Beach City Weird”, a few days ago? Well, no need – I just reviewed it a few days ago. One of my chief complaints about that episode was that at least two of the characters were turned quite stupid in order to aid the climax – crossing the line, or at least, toeing it. Which brings us to “Fusion Cuisine”, the episode on tonight’s menu. Synopsis: Steven loses his Ranger GUY, a part of his Guys Under Your Supervision collection. While his attempts to acquire one via the vending machine fail, he notices that Onion has it. Thing is, Onion, who is a rather… eccentric kid, is not willing to barter for Steven’s low-rung Dave Guys. 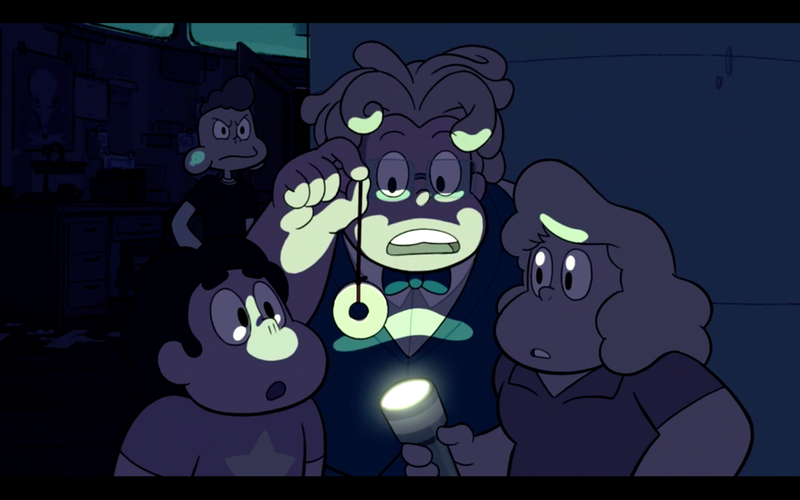 Amethyst points to a matter replicator to try and multiply the Dave Guys even further. Onion instead takes the replicator. Hilarity ensues.